In the fall of 2005, under the leadership of trustee Gene Westhoff, Carmans River Maritime Center developed its youth kayak building program with the idea of helping young people build strong interpersonal relationships with adult partners as well as building well crafted boats for, hopefully, lifelong use. We selected Chesapeake Lightcraft's Mill Creek 13 Kayak as the design of choice both for its esthetics and because our volunteer instructors had some experience with the building process of that design. It has proven to be a good choice. 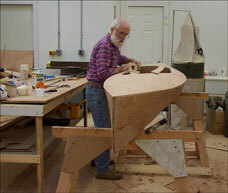 Our First Course, Building the Mill Creek Kayak, was held on the first three weekends of November 2003, in the newly completed Newey Boat Shop. 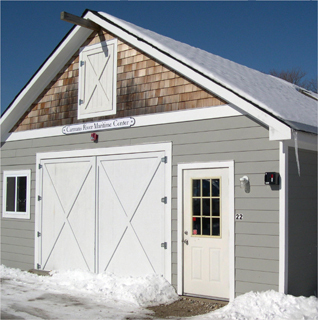 Though the weather outside was frightful, the shop was warm and delightful, for our Spring Semester of 2004. ABOVE: Member and student Joe Flaherty working on his almost-completed Mill Creek Kayak during the third weekend. For a slide show of photos from various stages of the course, click below.